Tundra plants have some unique characteristics. Due to the severe tundra climate their stature is short, and in most cases they have the ability to withstand extremely low temperatures, wind and drought. One of the main types of tundra plants is lichen – there are over a thousand different kinds in British Columbia, however, only three or four grow in the cold arctic tundra. Lichen are unique in that they are a fungus, with associated algae to provide chlorophyll for the fungus to live on. Several tundra animals have evolved to be able to utilize lichen as food. The aptly named reindeer lichen is used by caribou almost exclusively as winter forage. 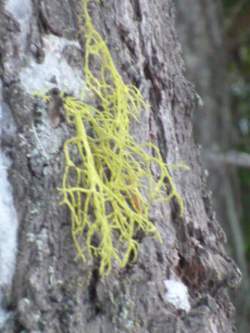 Native peoples used many kinds of lichen as a food source, for dyes in their clothing and baskets like the wolf lichen below, which is also poisonous, and was used to poison wolves and other creatures. Other tundra animals eat other types of perfectly adapted plants, contributing in turn to the symbiotic relationship of the tundra ecosystem. Snowshoe hares eat the tiny arctic willow, which in turn thrives on the fertilizer contributed by them. Arctic foxes catch the snowshoe hare, as does the tundra owl, weasel and various hawks. Many of the tundra animals conserve energy by hibernating through the long winter night. Voles, lemmings and other small creatures use vegetation to line their burrows to insulate it. Using the principle of safety in numbers, these live in colonies to keep warm together during their sleep. Other animals survive by hunting these creatures as they emerge periodically in warmer spells. Birds live in the tundra, primarily migratory birds that nest there in the short summer months, but also ptarmigan, a grouse like bird that can hide under the snow, to fly up in a startling rush if a predator comes near. Musk oxen are the biggest tundra animals, thriving on the sparse grasses and sedge of this seemingly barren place. If threatened, they form an outward facing ring of their ominous horns, protecting the young calves within it. Tundra plants mean the survival of all these hardy and well adapted creatures. Without the plants, there would be no other life. The permafrost beneath (where the frost stays in a permanent layer) requires that the plants do not generally have tap roots – a fine netting of surface roots is usually enough to obtain surface snow melt while anchoring the plant. Willows, the Salix genus, are a predominant tundra shrub. Unlike many other willows, these are of short stature and slow growing, found in tundra heath, high alpine and screes. These hardy plants are the Polar Willow, Salix polaris; Salix stolonifera, Salix reticulata and Salix arctica. These are adaptable to myriad conditions, including moist to dry alpine tundra and subalpine seepage areas, open subalpine ridges on various soil types and moisture availability and late snow bed and snow flush areas. Empetrum nigra, the Crowberry is a short creeping evergreen shrub, which produces black berries beloved by bears. Although it inhabits other ecosystems such as swamps, muskeg, cold coniferous forests and rocky mountain slopes, it is commonly found on subalpine parkland and alpine tundra. Partridgefoot, Luetkea pectinata is a small mat forming evergreen semi-shrub. Prostrate growth with small white flowers on moist heaths, tundra, meadows and mossy seepage areas. 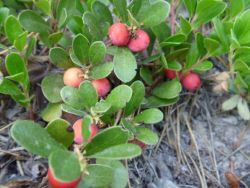 Arctostaphylos rubra, the red bearberry is sometimes confused with Salix reticulata, which it resembles. The willow can be identified by the paler undersides to the leaf, and if in season, the Arctostaphylos is a berry producing shrub. Deciduous, with slender brittle branches and papery shredding bark this shrub has beautiful red autumn colour, hence the name. Arctostaphylos uva ursi, the bearberry or kinnickinnick can cover large areas with its leather foliaged sprawling stems. This is different from the A. rubra as it’s evergreen, not deciduous. Bears and grouse love the bright red berries. Vaccinium vitis idaea is one of my all time favorite little shrubs. It’s been popular as a companion ornamental plant associated with other ericaceous plants like Rhodendron and is valued in gardens for its well behaved, clean appearance. 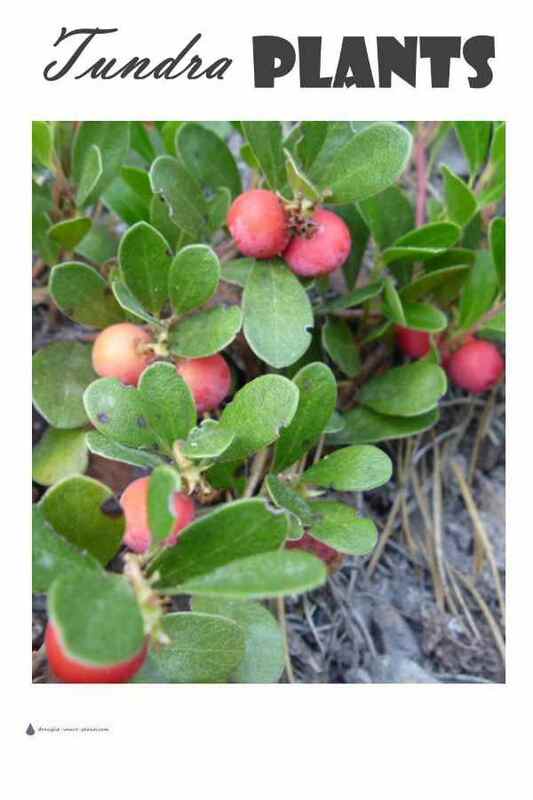 With the leathery leaves similar to Arctostaphylos which it is sometimes mistaken for, it has sour red berries that only sweeten after a frost. The common name is Lingonberry, from Scandinavian countries where it also grows. Vaccinium caespitosa, or the Dwarf Blueberry grows in thick colonies in some areas. The berries were valued by the northern and central interior native people, and dried in cakes for winter use. Dryas drummondii, Yellow Mountain Avens; this plant has been prized by alpine plant collectors for rock gardens. A pioneer of gravel bars, rocky slopes it particularly thrives on calcium rich soils and it has the ability to fix nitrogen from the air, enabling it to grow in very low nutrient sites. Langsdorfs Lousewort, a pretty bad name for a pretty flower, is Pedicularis langsdorfii. Spires of pinky purple flowers open in summer. Caribou and reindeer browse the top growth. Sudeten Louseworth, Pedicularis sudetica is a similar plant with more dense flowers in a pink shade. The Inuit used the roots of this species for food, and still do. Bistorta vivipara, the Alpine Bistort is an interesting plant – it produces tiny bulbils in the axils of its leaves which roll away in the wind to form a new colony. Used as a vegetable by the Inuit of Alaska and Siberia, indicating its wide range. Claytonia sarmentosa, Alaska Springbeauty is just that – pretty wide faced pink and white striped flowers in moist seepage areas near snowbeds and on streambanks. Draba alpina – the Alpine Draba is a dwarf tuft forming perennial with small yellow flowers. Difficult to accurately identify, there are several to many different subspecies, each with its own specific requirements. This species provides some vivid colour to the tundra in bloom. Blue Corydalis, the Corydalis pauciflora, is an unusual coloured flower to see in the tundra where it’s found in seepage sites along with Claytonia sarmentosa and Arnica lessingii. Sedum integrifolium, or Roseroot, is one of the few native stonecrops in the tundra. Called Roseroot due to the sweet scent of the rhizomes, it has dark purple or yellow variable flowers. Its other common name is Kings Crown, probably referring to the appearance of the flowers which are arranged in a dense cluster at the top of the stem. Gentiana glauca, the Inky gentian, is another blue flower, also prized by alpine plant enthusiasts. Campanula lasiocarpa, the mountain Harebell is a misleadingly delicate seeming plant. Thriving in cracks and crevices in exceedingly tough conditions, its out of proportion large flower are purple blue, and usual borne singly. Trisetum spicatum, the Spike Tresetum is an important forage plant for tundra animals. Hierochloe alpina or Alpine Sweetgrass is named for its sweet scent – also known as holy grass after its use in religious ceremonies by native peoples. Calamagrostis purpurascens, Purple Reedgrass prefers a dryer condition than some of the Calamagrostis tribe. Growing in well spaced clumps in such sites as grassy ridges, rocky slopes and dry open forests it is adaptable to many sites. Poa alpina, the Alpine Bluegrass is a valuable species for forage by both wild and domesticated animals. It grows particularly well on disturbed or compacted sites such as along game trails. Poa arctica, the Arctic Bluegrass is a variable species which also goes by the name P. grayana. Dunhead Sedge, or Carex phaeocephala is a fairly common sedge of the tundra, found in rocky grassy tundra and open scree slopes where it’s thick mat of roots will hold it in place. Black Alpine Sedge is Carex nigricans. Forming hummocky mats the leaves are densely packed and it has creeping rhizomes, unlike many other sedges. It prefers high snowfall areas. Cetraria cucullata, the Curled Cetraria is a common lichen of windswept grassy alpine tundra. Cetraria nivalis is similar differing only in some minute taxonomical characteristics. These grow together in groups. Cetraria tilesii grows in calcium rich soil and gravel in alpine tundra. Cetraria islandica, or Icelandmoss has been used by many northern people as a food source. Dried and powdered, it is reconstituted into a jelly like gruel, or added to soups and stews. It’s also used as an ingredient in cough candies in Switzerland. Xanthoria elegans or the Rock Orange Lichen is used to identify raptor nesting sites and perches, as it thrives on the nutrient rich droppings of the birds. Interestingly, this species growing on the graves of the ill fated expedition of Sir John Franklin have only grown to a diameter of less than 4.5 cm – the expedition was over a century ago. Grey Reindeer Lichen or Cladina rangiferina, this is used by the florist trade to make wreaths, floral decorations and architects models. Species of Cladina and Cetraria make up the majority of the diet of caribou through the winter. So there you have it: Even a hostile environment like tundra can support a wide variety of plants and animals that require them to survive in an almost perfectly balanced ecosystem. 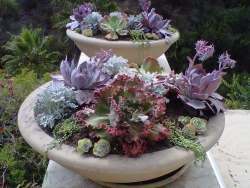 Want your succulents to survive the winter? Learn how to bring them indoors and be happy and healthy with this free e-course; Fill in your name and email address on the form below to enroll! How can I keep my Succulents happy for the winter? Find out here!